Alice Bag, Leggy, Devious Ones August 15th at El Club, Detroit. Day 1 of @VivaPomona fest, @AliceBag with @ShanandtheClams, others. Alice Bag Official Record Release Party At The Echo July 2nd: event details and tickets on sale now. Words and Music, Alice Bag - live performance, reading and Q&A at ELAC, March 10, 2016. Free and open to the public. Allston Pudding presents Alice Bag in live spoken word and musical performance. Pre - BFF Fest Party in Detroit @UFOFactory on 7/24. Music Art and more, come out and say hi! Alice Bag and the Baguettes perform Pipe Bomb for the Soul on 7/23/15 at The Comet, Cincinnati OH. Grab a beer and Pipe Bomb for the Soul in Ypsilanti, MI on Tuesday, 7/21 at 8pm. I will be reading, performing and talking about Louis Jacinto behind his back...wait...what, he's going to be there? Scratch the last part. It will be fun, come on down. Reading and performance with discussion of body image with Gloria Lucas. Fundraiser for Ovarian Psyco-Cycles. THIS EVENT HAS BEEN MOVED TO A LARGER VENUE! PLEASE NOTE NEW LOCATION. 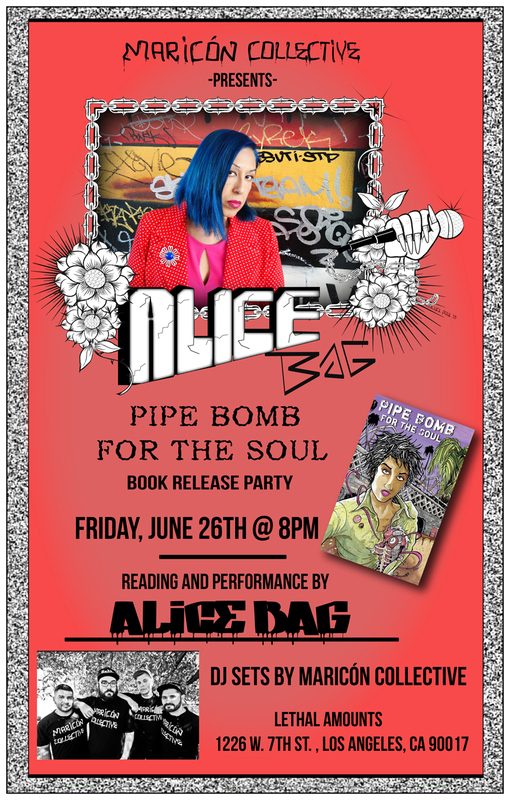 Alice Bag book release pari/party for Pipe Bomb for the Soul at Lethal Amounts in DTLA, 8pm - get there early if you want to get in. DJ sets by Maricon Collective, reading and performance by Alice. Book will be available for purchase. I will be reading and performing with excerpts from Violence Girl and my new book Pipe Bomb for the Soul.